All natural ice pops are another great partner to French women’s summer diet. So how about enjoying an all natural homemade ice pop or one of these trendy gourmet paletas at home? They are excellent for your health and weight management when prepared with fruits and yogurt or simply fruits. All you need are ice pop molds but there are so many choices — and ice pop molds are not all created equal! At Art of the Home, we love our “yellow” molds (we use Tovolo Yellow Groovy Ice Pop Molds). They get in and out of the freezer all summer long and as the summer is getting to an end, there is nothing like an ice pop to remind us that summer is not quite over yet, so let’s keep that summer joy going with some delicious ice pops! The best ice pop molds we are talking about are the Tovolo yellow groovy ice pop molds! Tovolo makes various shapes and colors but we do like this one for it shape (great for paletas!) and color (yellow is just such a joyful summer color!). During the summer, ice pops are delicious low calorie snacks and if you can make them with fresh fruits — so tasteful and nutritious! Check our Art of the Home best ice pop molds review below for tips on how to choose your ice pop molds. Why do I need ice pop molds? Being able to make your own ice pops at home is a great way to eat all natural ice pops as well as to get a good amount of your daily fruit and dairy serving requirements. Ice pops are so refreshing in the summer and make a great healthy snack when made at home. You know exactly what’s in them which is not always the case for store bought ice pops. They also make great summer gifts and it is truly a gift that keeps on giving! How do I use my ice pop molds? Very easy. 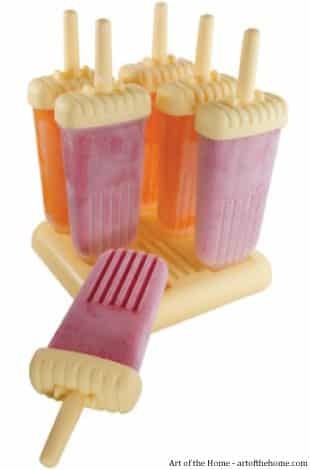 These ice pop molds hold about 1/2 cup of juice, sorbet or ice cream. Make your pop mixture with your blender or ice cream maker. Fill up the molds, leave them in the freezer for a few hours and your ice pops are ready. To un-mold, run warm water over the molds for about 10 seconds and enjoy! What should I be looking for in ice pop molds? Durability: that is a key feature — those molds go in and out of the freezer so they need to sustain frequent change of temperature. A quality, durable and strong material is very important. Easy Grip: look for a good base design. Preferrably all in one so your ice pop doesn’t leak on your hands. Functionality: you want to be able to easily pour the mixture you want to freeze inside the mold. You also want to be able to take your pops one at a time. Price: less than $10. Considering the price of all-natural ice pops or ice cream fruit bars at the store, you can make your money back by saving on about 2 boxes of store bought ice pops. Durability: crafted in BPA free durable and strong plastic. Easy Grip: love that grip and it’s made of one piece (built-in sticks and drip guards) so no leakage. You can also remove ice pops individually which is a plus. Functionality: this design is a bit narrow compare to other Tovolo designs so especially for thick creamy ice pops, pour mixture carefully. Price: very reasonable at Amazon (currently over 20 % off on Amazon and cheap too!) considering how much the premium ice pops cost. Size: this is not con per se but just a warning. These pop molds are a bit big and may even be too big for smaller children. You can however eat your ice pops in 2 sittings (by covering it with its plastic mold and returning to the freezer) but we have not had to do this once! 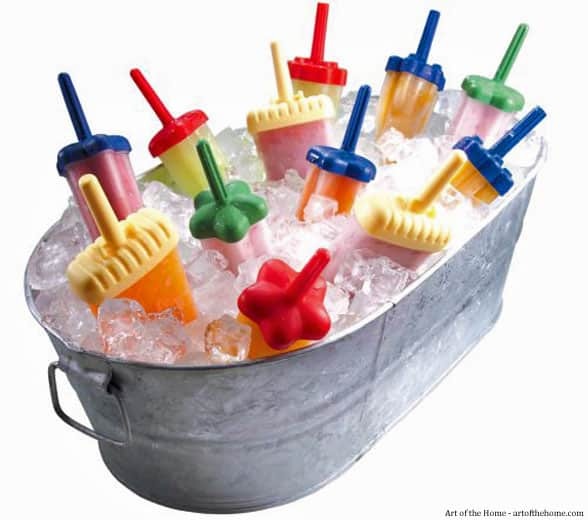 So to end the summer with all natural ice pops, Art of the Home recommends the highly rated, durable, and low-price Tovolo Yellow Groovy Ice Pop Molds.